Once in a while we are lucky enough to create a painting that somehow is a little bigger than we are. 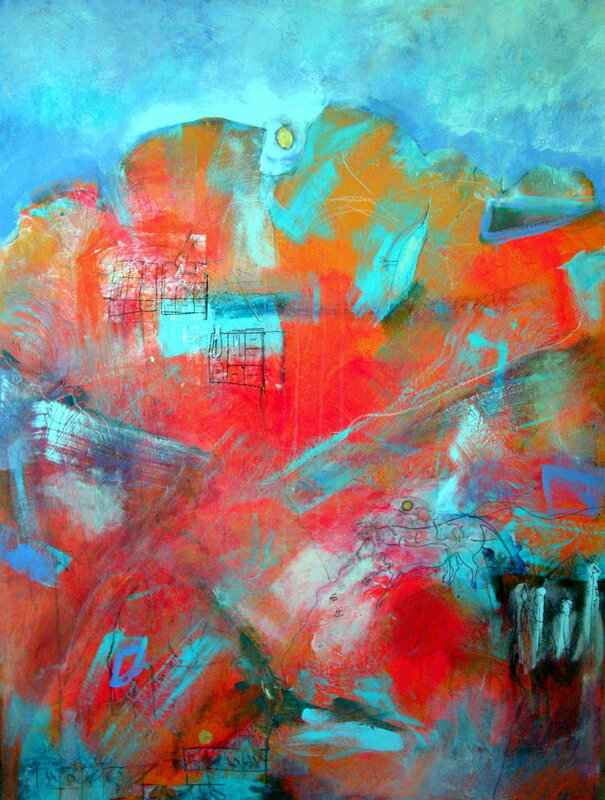 This painting, A History of Home, was that for me. I want to take the time here to let the painting tell her story, her history of coming into existence. It’s sometimes difficult for an artist to really explain what went into a particular painting. In these days of marketing, the emphasis is on the “elevator speech,” a short, catchy, 5-second summary. What a nightmare– trapped in an elevator and having to give a speech! I won’t be doing any “elevator speeches” any more, in my studio or anywhere else. Life is too short to waste it on the superficial. This will be a wandering journey, like the entries to painted caves. The second painting of a triptych, I envisioned painting a series of abstract “maps,” entries to a colored world of cave and imagination. In this one, we have begun to enter the painted caves, specifically Lascaux cave. We stand at the threshold. It is a map of dreamtime, perhaps similar to Australian ritual paintings that mark imagined geographies mixed with “real” landmarks. It fascinates me that parts of the painted caverns are actually called “galleries.” They may have been our first cathedrals: most were not inhabited. I am often inspired by the maps of the passages of the caves, and their abstract forms that are very unlike maps of the daytime world. Some of the marks in the painting feel like one of these “gallery maps” to me. I really love the line drawings the earliest modern archaeologists did as reproductions of the paintings. Because photography was more primitive at the turn of the century, most archaeologists were adept at sketching artifacts and paintings. Almost all archaeologists who were allowed to enter the caves were male, of course. The most famous was “The Pope of Prehistory,” Henri Breuil. He did the most amazing drawings of cave paintings and petroglyphs from around the world. I’ve spent a lot of time, literally many years, seeking out books with Henri Breuil’s drawings in dusty shops in so I could own some of his reproductions, with little success. I think what was “drawing” me was the beauty of the originals, but also a fascination of entering the world of the caves through transcribing the marks and animals by hand. On the other hand, so to speak, I didn’t want to do reproductions of cave animals, no matter how compelling and beautiful. The caves themselves show centuries, perhaps millennia, of overwriting– animal on top of animal, elaborations and erasures, adaptions, handprints, and abstract graphic marks that were most likely a symbolic language. Generations of hands, eyes, pigments, footprints, erosion, stalactites, mud and flickering lights. Generations of whatever went on in these deep galleries. I wanted that. I wanted to enter that process, the one that started 35,000 years ago and is still going on today. Entry to cave on the island of Levanzo off the coast of Sicily. 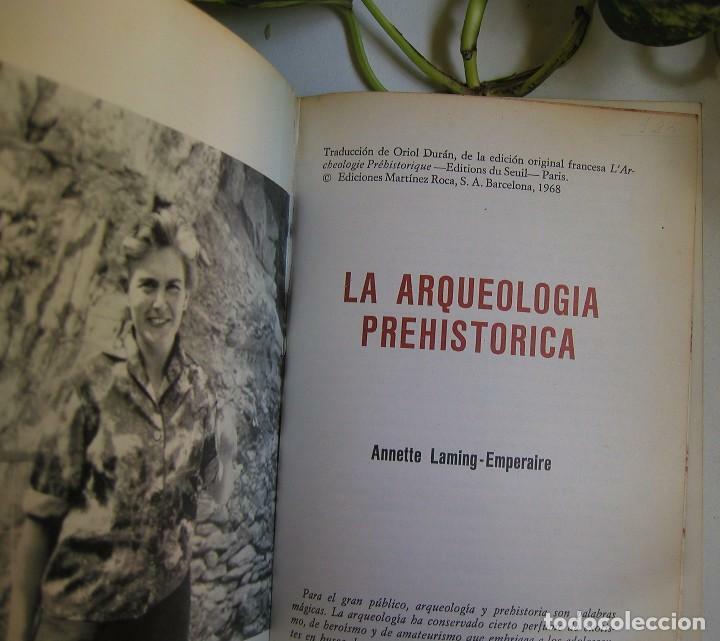 I found that one woman archaeologist had documented Lascaux cave, Annette Laming-Emperaire. A part of the French Resistance, she entered Lascaux in the 1950’s and documented paintings and marks as a part of her doctoral thesis. Her method of cataloging and interpreting cave art is still in use today. 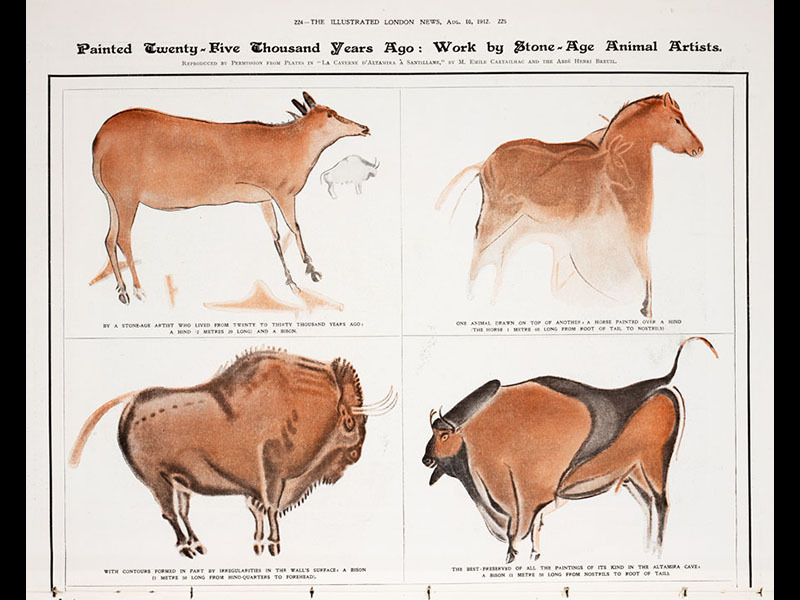 But what fascinated me the most were her line drawings of cave paintings: sets of different style bison horns, diagrams of colored areas, and superimposed animals. I wanted to use her marks, so I enlarged them with a copy machine, created transparent acrylic transfers, and embedded them in the painting. The black line drawings and diagrams are sunk in a dense field of paint. Because they are transparent, the paint underneath is visible. The painting has multiple layers. Just last year I found that my paintings transform with 3-D glasses; the translucent bright layers, and the use of fluorescent paint, help facilitate. With the glasses, the layers separate, and the lines float in an intermediate space on the picture plane. Viewer looking at paintings with 3-D glasses at the Paleomythic show. Chalk horses on “cave” wall by Caren Catterall. I am pleased that it is going to the home of Rachel, Brendan and Tabitha Welsh in Alexandria, Virginia. Their home was built in the 1790’s, so A History of Home will reside in a home with history.